What are the underlying physics behind how many of the greatest lead guitarists in rock have instinctively achieved their signature sounds? 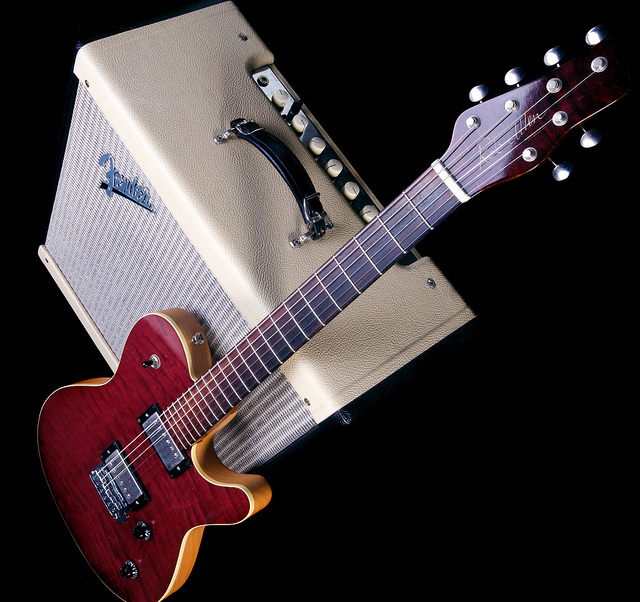 Ever wonder how Jimi Hendrix, Eric Clapton, Jimmy Page, Eddie Van Halen and Jorma Kaukonen¹, among many others, so mastered their Strats and Gibsons? First, I suggest checking out Rolling Stone’s list of the 100 Greatest Guitarists for a comprehensive list. In addition to all these virtuosos, for an example I also urge you to a listen to the extended guitar intro Bruce Springsteen played to Prove it All Night during a September 18, 1978 performance at the Capital Theater in New Jersey for a truly astonishing and blistering performance (expertly supported by E Streeter Roy Bittan’s extraordinary work on the piano). How do they do it? For the benefit of all of the countless guitar players in the world, how do these masters produce such distinctive guitar sounds? An article entitled The Physics of Playing Lead Guitar was posted on Phys.org on July 23, 2014, described the work of Dr. David Martin Grimes at Oxford University’s Department of Oncology. His regular gig is as a medical researcher. But he is also a guitarist in a band who has been working on understanding the physics of playing lead. He has focused his research here upon the elements of pitch and how they are affected by such factors as the height of the strings above the neck, how strings are “bent” by the musicians, vibrato and whammy bars. For any musicians as well as others who appreciate the intersection of art and science involved here (but who might only know how to play the radio), I highly recommend a click-through and read of this piece to learn about Dr. Grimes’ unique and, well, sound analytical work. Many of the rock guitar icons mentioned in the original post above, in addition to many others of equal stature, owe much of their success to the original developer of the solid-body electric guitar, Les Paul. A very admirable summary of his life’s work and accomplishments is clickable here in Wikipedia. He was a pioneering musician, recording innovator, songwriter, string instrument builder (also known as a “luthier”), and inventor. For many decades since he created the first truly electric guitar, the Gibson Guitar Les Paul line of guitars has been revered among musicians around the world and been responsible for some of the greatest music of modern times across a wide array of musical genres. An incredible artifact from Paul’s life, the original prototype of his electric guitar called “Black Beauty”, is scheduled to be auctioned on February 19, 2015 by Guernsey’s in New York at the Arader Gallery. Here is the page from Guernsey’s website with the description and photos. This upcoming event was covered in a very interesting report in the February 10, 2015 edition of the New York Times entitled Les Paul’s Groundbreaking Guitar Prototype Is Headed for Auction by James Barron. I will sum up some of the key points. I highly recommend clicking through for a full read and to see three additional photos of the Black Beauty. It is truly an astonishing thing to see in these pictures. Les Paul worked closely with Gibson to get everything just right for this truly revolutionary instrument. There also is a gem of s story in the article about how, Thomas Doyle, the luthier he worked with for many years, ended up purchasing Black Beauty for $1,100 many years ago. According to Arlan Ettinger in this article, the president of Guerney’s, it could possibly sell for $2 million². Other items including a “mixer” or soundboard that Les Paul used in his own legendary live performances, microphones, recorder and concert set lists will also be available at this auction. I could easily foresee the bidding becoming very competitive. Although for anyone who has the resources to make a serious bid, my advice is that they should not, well, fret about even going beyond their limits to acquire this cornerstone of modern musical history. Just to embellish this story a little bit more, eleven years ago, I read a very engaging and offbeat book entitled Poplorica: A Popular History of the Fads, Mavericks Inventions & Lore That Shaped Modern America by Martin J. Smith and Patrick J. Kiger (Harper, 2004). It contained a chapter about how Les Paul invented the electric guitar. I cannot quote this verbatim, but one very clever line in that chapter has always remained in my memory because of its imagery and imagination. The gist of it went something like this: When Les Paul invented the electric guitar in the late 1940’s, he could not possibly have foreseen that one day, decades later, Jimmy Page would be using it to create the sound of a T-Rex being being chain-sawed in half. How true and 100% cool! 1. For a wonderful bio and retrospective on Jorma’s remarkable career and extraordinary musicianship, I highly recommend Jorma Kaukonen: Still Working the Roots by Barry Mazor, which was posted on Medium.com on February 8, 2015. From his vast catalog of albums, I urge you to check out Sea Child on Hot Tuna’s Burgers album for his highly unique guitar style and songwriting. 2. In somewhat of a surprise result, Les Paul’s Black Beauty electric guitar was won at auction for a successful bid of $335,000. This was quite a bit below preliminary estimates of its value. The winning bidder was Jim Irsay, the owner and CEO of the Indianapolis Colts. Here are the complete details in an article in the February 19, 2015 edition of The New York Times entitled Owner of the Colts Pays Six Figures for a Les Paul Six-String by James Baron. My gratitude to the reporter for a great story well told by him. I only speak two languages: English and New York. Some visitors to NYC, especially those for the first time, often feel like they are hearing some otherworldly dialect of English being spoken here. I am always amazed and a bit envious when I people are genuinely fluent in more than one language. I have friends and colleagues who can converse, write and even claim to think in multiple languages. Two of them immediately come to mind, one of whom who can speak 5 languages and the other can speak 6 languages. How do they do it? Thus seeing an article posted on Gigaom.com entitled A Massive Database Now Translates News in 65 Languages in Real Time by Derrick Harris on Feb. 19, 2015 immediately got my attention. I will sum up, annotate and add some comments to this remarkable story. The Global Database of Events, Languages and Tone (GDELT) is an ongoing project that has amassed a database of 250 million “socioeconomic and geopolitical events” and supporting metadata from 1979 to the present. GDELT was conceived and built by Kalev Leetaru, and he continues to run it. The database resides in Google’s cloud service and provides free access and coding tools to query and analyze this massive quantum of data. Just one representative of GDELT’s many projects are an interactive map (available on GDELT’s home page), of conflicts and protests around the world. Support for this project is provided by The US Institute of Peace. an independent and nonpartisan American government institution. Here is a deep and wide listing from GDELT’s blog that links directly to more than 300 of their other fascinating projects. Paging through and following even a sampling of these links will very likely help to spark your own imagination and creativity as to what can be done with this data and these tools. On February 19, 2015 GDELT 2.0 was launched. In addition to a whole roster of new analytical tools, its most extraordinary new capability is real-time translation of news reports across 65 languages. The feeds of these reports are from non-Western and non-English sources. In effect, it is reporting from a different set of perspectives. 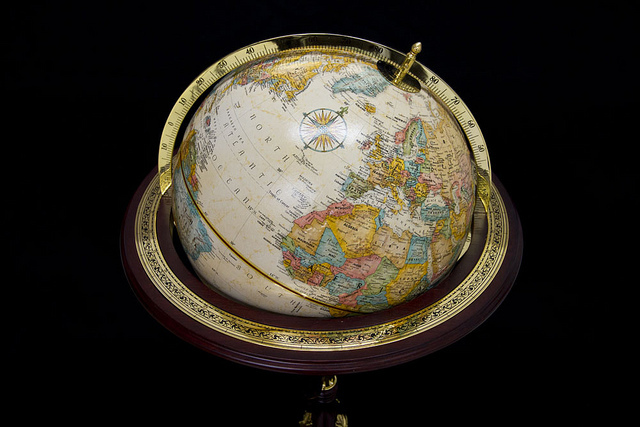 The extensive details and parameters of this system are described in a February 19, 2015 blog post by Mr. Leetaru on GDELT’s website entitled GDELT Translingual: Translating the Planet. Here is an accompanying blog post on the same day announcing and detailing many of the new tools and features entitled GDELT 2.0: Our Global World in Realtime. Among these is a capability called “Realtime Measurement of 2,300 Emotions and Themes” composed of “24 emotional measurement packages that together assess more than 2,300 emotions and themes from every article in realtime”. This falls within the science of content analysis which attempts to ascertain the deeper meanings and perspectives within a whole range of multimedia types and large sets. I highly recommend checking out the Gigaom.com story. But I believe that is only the start if GDELT interests you. I further suggest clicking through and fully exploring their site to get a fuller sense of this project’s far-reaching vision and capabilities. Next, for the truly ambitious, the data sets and toolkits are all available for downloading right on the site. I say let the brainstorming for more new projects begin! Back on December 2, 2014 in a Subway Fold post entitled Startup is Visualizing and Interpreting Massive Quantities of Daily Online News Content, we took a look at an exciting new startup call Quid that is doing similar sounding deep mining and analysis of news. Taken together, they represent a very fertile field for new endeavors like GDELT and Quid as the sophistication of machine intelligence to parse, and the capacities to gather and store these vast troves of data continues to advance. For both profit and non-profit organizations, I expect that potential benefits from deep global news analysis, interpretation, translation, visualization and metrics will continue to draw increasing numbers of interested and ambitious media companies, entrepreneurs, academics and government agencies. Studying for and then taking the New York State bar exam was about as much fun for me as having a root canal without Novocaine. In fact, root canal might even have been preferable. Nonetheless, the most extraordinary learning experience I have ever had while studying for anything up to that point was attending a two-day comprehensive lecture on the Federal Rules of Evidence by the legendary law professor Irving Younger. This subject is a challenge to fully master and always a favorite topic throughout the exam. Having attended Professor Younger’s mesmerizing lectures, not only did I feel prepared for the questions on evidence but I left fully convinced that he could have taken in anyone at random walking by the building and taught him or her enough about this subject to pass. Please check out this video on YouTube of his dynamic lecture on 10 Commandments Of Cross Examination at UC Hastings College Of The Law for, well, incontrovertible evidence of this. For many years during and after Professor Younger’s life, some US law schools kept audio tapes of his lectures on evidence and civil procedures on file in their libraries. If he was lecturing today, it is a near certainty that his classes would now accessible across the Web. discussion forums available. Homework assignments and projects are often part of the MOOC experience. Users can audit these courses, obtain certifications for having attended them and done the course work, and even have degrees conferred. MOOCs related by topic are often group together into pre-packaged options. Of course, the quality of these offerings can vary quite a bit. But to a highly significant degree the web is transforming the process of education. If you are not yet familiar with this revolution in education, I suggest starting with this report by correspondent Sanjay Gupta on 60 Minutes on CBS that was first broadcast on September 2, 2012. It is about the wildly popular and highly effective classes offered online by The Khan Academy for students around the world on a multitude of subjects. The video classes are largely designed for grade school through high school levels. I think The Khan Academy’s smashing web-wide success with students and educators add new credence and incentive the old adage that a great instructor can effectively teach his or her subject to anyone interested in learning new things. Smarter by Sujan Patel is a terrific reference and fully linked on-ramp to today’s leading MOOC providers for business, finance, tech and academic topics. During the past year I have had an opportunity to take a number of MOOCs available on Coursera.com (one of the 15 online providers covered in this article). Two of these quickly became Professor Younger-like experiences from which I learned more than I could have imaging at imagined from the course description when I registered, and for which I am deeply grateful for having had the opportunity to participate. The first was Content Strategy for Professionals: Engaging Audiences for Your Organization taught by Professor John Lavine of the Medill School of Journalism at Northwestern University. (Creating a free membership online will give you access to the links for both classes described here.) This was a brain-bending six-week MOOC that thoroughly defined, explored and demonstrated what exactly “content strategy” is in the rapidly changing world of e-commerce and how to put its best practices into action. The home page for this MOOC does an expert job of describing the particulars. The second was Understanding Media by Understanding Google taught by Professor Owen R. Youngman, also of Medill. This was a captivatingly deep and wide examination of the numerous services, influences and technologies that have made Google such a pervasive global phenomenon. Again, please see this MOOC’s home page for the flight plan of an educational journey will not soon forget. In both of these MOOCs the classes were given assignment and projects to provide valuable practical experience that could readily be adapted and applied back in the workplace. Moreover, what I found that really rocked were the discussion forums for these MOOCs. Thousands of participants from across the globe generated and joined into thousands of online discussion threads about the contents of each week’s lectures. A strong sense of community quickly arose and rarely have ever seen such high bandwidth, crackling virtual exchanges of ideas, experiences, commentary and enthusiasm as I did here. The highest levels of civility and respect were also scrupulously maintained by everyone who participated. Both of these MOOCs will be given again in 2015. I highly recommend checking the Coursera site for their scheduling and then registering for them. Did I mention that these two MOOCs and all others of Coursera, as well as the majority in the links to Wikipedia and BusinessInsider.com above are reasonably priced to sell: They are available for free! Are MOOCs still being perceived as truly disruptive? Well, maybe not so much for now at least. Notwithstanding my enthusiasm and appreciation above for MOOCs as a genuine shift in the paradigm of technology-enabled learning, their star might not be shining as brightly as before. According to an article posted on the Chronicle Of Higher Education’s website on February 5, 2015, entitled The MOOC Hype Fades, in Three Charts, by Steve Kolowich, the latest data gathered about this phenomenon appears to be trending this way. I will sum up some of the key points, and ad some links and comments. I urge you to click through for all of the details and three informative charts. The Babson Survey Research Group released its 2014 report entitled Grade Level: Tracking Online Education in the United States, 2014 on February 5, 2015. Its initial key finding is that while the number of schools offering MOOCs has steadied at 14%, doubts remain among 2,800 academics surveyed that online courses could generate funds or reduce costs. The first chart clearly shows sentiment in this regard has reached nearly 51%. The fiscal sustainability of MOOCs depends on these educators’ points of view. A mere 6% actually expected MOOCs to make money or lower costs. Rather, their main motivation for their MOOCs is to raise their school’s profile and enhance student recruitment. They further realize that quantifying this is rather difficult. The second chart is a bar graph of six factors those surveyed believe will prospectively have the largest effects upon higher education. “Cost/student indebtedness” ranked highest with 62% and “self-directed learning” ranked last with just 9%. According to the third chart, 20% of the schools also felt that trying out MOOCs would provide “new insights about teaching and learning”. Nonetheless, there has been a steep decline from 50% to 28% in the last two years of the number of schools that felt compelled to learn more about “online pedagogy” (which, in its simplest terms, means studying and implementing the best teach methods). Thus, according to this Chronicle article, the “hype” surrounding MOOCs has been reduced. 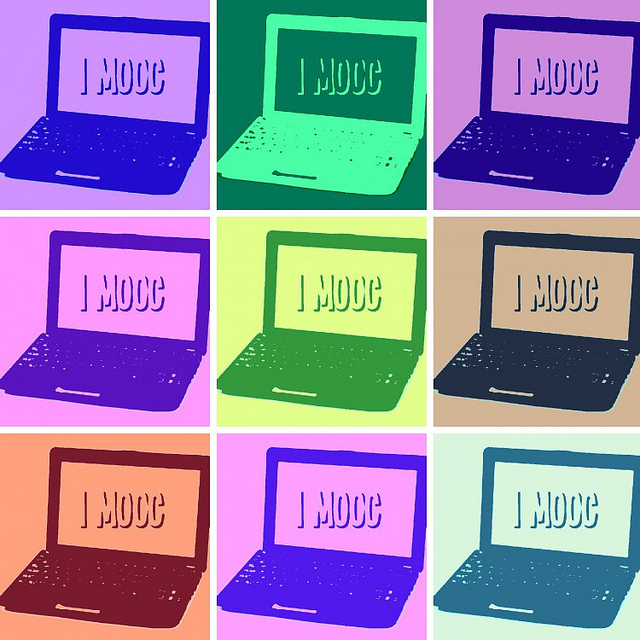 Educators are trending towards not seeing MOOCs as quite so transformative. Rather, the consensus is now that MOOCs have their place in recruiting and research for those schools with the resources available. These findings also provide incentives for those schools still reluctant about MOOCs to at least give them a try. The growing utility and ubiquity of MOOCs can reach people across the web who neither have the time nor funds to attend traditional classes. They are indeed priced to sell and free is a tough price to beat for such a useful and dynamic product. Attending MOOCs helps students to maintain and enhance their levels of skills and knowledge which, in turn, have an upward effect on wages. As educators and MOOC platforms such as Coursera continue to move up the experience curve they will be able to better market their content and shape their course offerings. Moreover, they will continually learn and thus refine how MOOCs are structured, taught and distibuted. 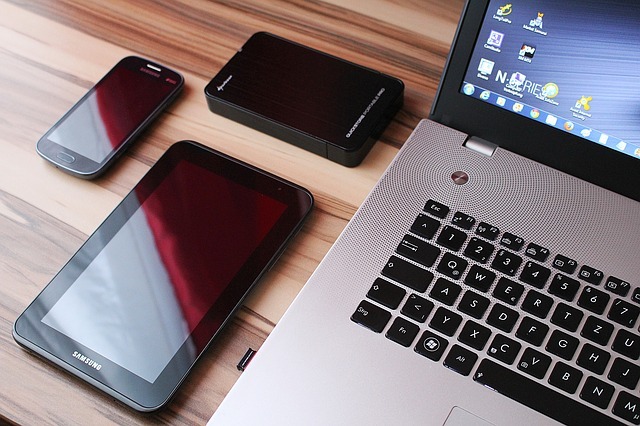 As mobile technology, web accessibility and cloud storage capabilities continue to accelerate while getting smaller, faster and cheaper, MOOCs will likewise be able to take advantage of these trends and reaches even greater numbers of students with more expansive offerings. Their economies of scale will continue to be reached and surpassed. Based on my own personal experience with 10 MOOCs during the past year, I have found them to be invaluable in keeping my skills and knowledge current in a number areas. I have learned about subjects, resources and online communities that I might have not otherwise had an opportunity to discover. Surely many other MOOC participants have had the same experience. A remarkable moment in modern advertizing occurred during the 2013 Super Bowl when the power temporarily went out at the Superdome stadium in New Orleans. Oreo cookies quickly put out a tweet with an accompanying photo that read “Power Out? No problem. You can still dunk in the dark.” It has since been widely heralded as a spontaneous stroke of genius and proved to be incredibly effective across the Twitter-verse. The story of how this happened, including the actual tweet and graphic, were told in a concise report on CNET.com entitled How Oreo’s Brilliant Blackout Tweet Won the Super Bowl by Daniel Terdiman on February 3, 2013. The story was widely reported elsewhere in traditional and social media venues. Two years later, the 2015 Super Bowl itself ended in incredible drama. Neither any sports writer nor the NFL itself could have scripted a more improbable ending. Discussions of the final minute of the game broke out instantly across social and traditional and will likely continue on for years afterwards. In addition to the hard lessons learned here about football strategy, about half of the sponsors of the game have also gained valuable troves of insightful data and the resulting analytics from the Twitter hashtags they included in their TV commercials. A very interesting and instructive report on this process was posted on SocialMediaToday.com on February 15, 2015, entitled How Advertisers Are Tracking Their Ad Dollars Using Hashtags: Lessons from the Super Bowl, by Tukan Das. I will recap, add some links, and commentary to this article. I suggest clicking through and reading it in its entirety for its detail and helpfulness. This story also tracks well with two other Subway Fold posts about the applications of Twitter data and analytics to marketing and business development entitled New Analytical Twitter Traffic Report on US TV Shows During the 2013 – 2014 Season (July 31, 2014), and then Is Big Data Calling and Calculating the Tune in Today’s Global Music Market? (December 10, 2014). According to the report on SocialMediaToday.com, the virtual “water cooler discussions” that occurred on Twitter around the advertisers’ hashtags embedded in their TV ads showed that users are now employing multiple screens to experience the game (the television screen and then at least one other computing device’s screen). These additional screens can be used to track and analyze the value per ad dollars spent while the advertisers evaluate their social media data in real-time rather than traditionally having to wait for TV viewing data to arrive. By further adding specialized demographic data into the mix, the advertisers can thus more deeply assess their data, scaling from in the aggregate level all the way down to the individual level. This gives advertisers the opportunity to observe and assess individuals “interacting with their brand” and pinpoint the “influencers” on Twitter among them. Furthermore, they can overlay an additional layer of data onto their contemporaneous hashtag analyses by using prior Twitter exchanges involving their audience in an effort to illuminate “brand affinity, preferences, and attitude changes over time”. What calculations and considerations are used when advertisers select their hashtags for advertising on TV and other media? 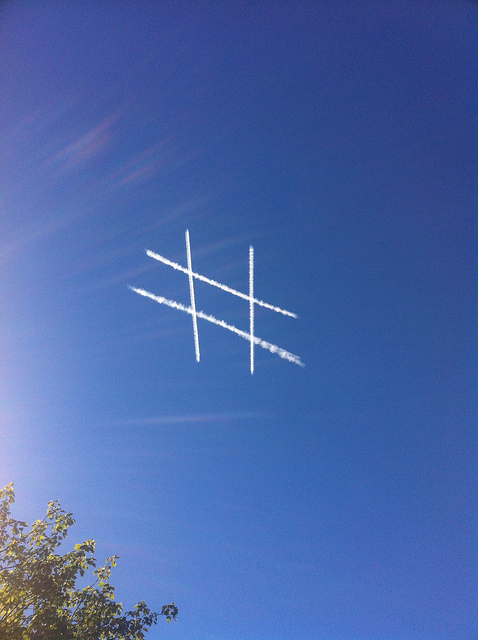 Does Brand X use one hashtag for a certain media platform and/or audience than they do for another? Does Brand Y in the same market sector use a similar or different approach? How, if at all, do geographic factors affect the choice of advertising hashtags? Will viewers and readers from one area of the US respond differently than another area to the same hashtag? Is there any difference in hashtag strategy from country to country or does the global nature of TV and the social media eliminate such considerations? If a particular hashtag worked well for 2015’s Super Bowl, should it automatically be re-used for next year’s game or should marketing and content strategists re-evaluate their hashtag formulation and selection process? Are advertising hashtags usually devised by a company’s internal marketing and analytics staff members or do they more often engage outside consultants for assistance with this? This post was originally uploaded on February 10, 2015. It has been updated below with additional links to new articles and a podcast on April 5. 2016, August 17, 2017 and December 27, 2018. Produces a calming effect on your demeanor when you repeatedly write down positive thoughts. Helps to coordinate the activities of the left and right (and maybe “write”, too), cerebral hemispheres. Improves cognitive skills. The article links to another very interesting article that appeared in the October 10, 2010 edition of The Wall Street Journal entitled How Handwriting Trains the Brain by Gwendolyn Bounds. “Inspires creativity” because writing is slower than keyboarding thus giving you more pause to consider what you are doing. Continues to keep minds sharp as people age. Uses the connected areas of your brain for reading while you are writing. Studies have shown this is not the case with keyboarding. Today’s edition of The Wall Street Journal carries an article entitled Can Handwriting Make You Smarter?, by Robert Lee Hotz. The short answer to this question is indeed yes. This fascinating articles reports on the findings of researchers who have been studying whether students retain and understand college lectures better by taking handwritten notes or by using a laptop in class. I highly recommend reading this in its entirety. I believe that it provides some very worthwhile follow-up information to the above post. 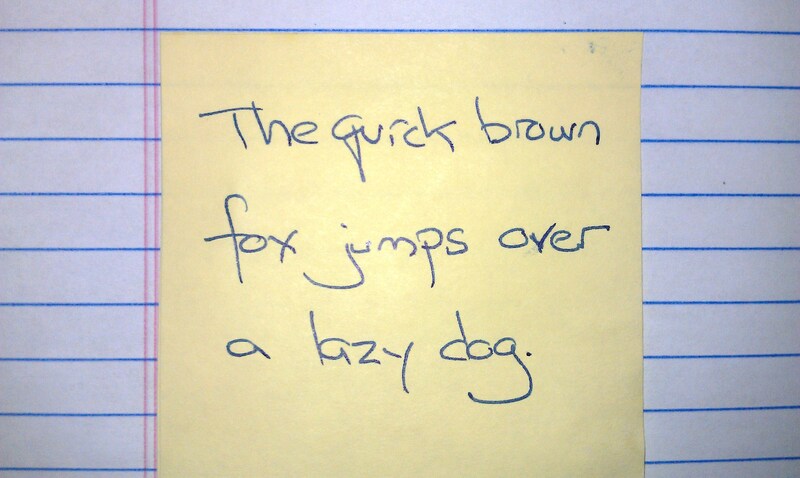 For an additonal and highly informative resource on the many benefits of handwriting that persist in the digital age and follow on directly with the above post and update, I highly recommend the podcast and its transcript entitled Who Needs Handwriting?, first broadcast on the NPR radio network on February 10, 2016, available on Freakonomics.com. I recently heard this on a rebroadcast and found it to be directly on point here. The Style section of today’s edition of The New York Times has a fascinating article entitled Let the Fountain Pen’s Flow!, by Miranda Purves. This is an in-depth and very informative report on the upswing in sales of highly diverse range of specialty pens, inks and papers. There are also highly sought after brands of these items, special showings and events, and even podcasts and YouTube channels catering to these aficionados of write and wrong. This was very enjoyable reading and I strongly suggest a click-through and read of it if you have an opportunity. 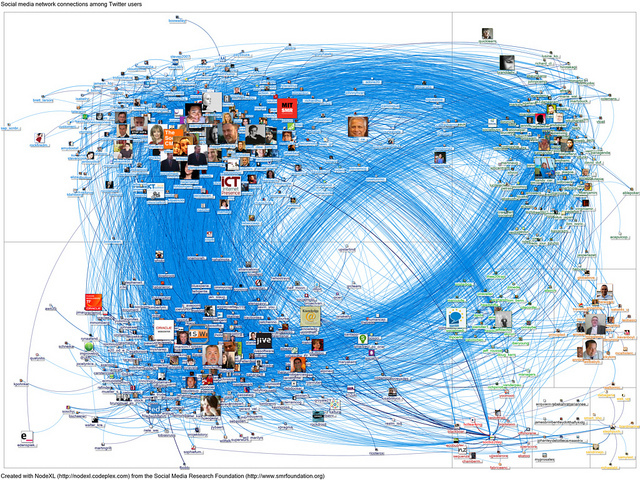 Have you ever wondered what a visual map of your Twitter network might look like? The realization of such Twitter topography was covered in a terrific post on September 24, 2014 on socialmediatoday.com entitled How to Create a Visual Map of Your Twitter Network by Mary Ellen Egan. To briefly sum up, at the recent Social Shake-Up Conference in Atlanta sponsored by SocialMediaToday, the Social Research Foundation created and presented such a map. They generated it by including 513 Twitter users who participated for four days in the hashtag #socialshakeup. The platform used is called NodeXL. The resulting graphic of the results as shown in this article are extraordinary. Please pay particular attention as to how the “influencers” in this network are identified and their characteristics. I strongly urge you to click through to read this article and see this display. For an additional deep dive and comprehensive study on Twitter network mapping mechanics, analyses and policy implications accompanied by numerous examples of how Twitter networks form, grow, transform and behave, I also very highly recommend a report posted on February 20, 2014, entitled Mapping Twitter Topic Networks: From Polarized Crowds to Community Clusters by Marc A. Smith, Lee Rainie, Ben Shneiderman and Itai Himelboim for the Pew Foundation Internet Project. Am I reaching my target audience? Is this map reliable as a sole indicator or should others be used? Who are the key influencers in my network? Once identified, can it be determined why they are influencers? Does my growth strategy depend on promoting retweets, growing the population of followers, getting mentioned in relevant publications and websites, or other possible approaches? What I would really be like to see emerge is a 3-dimensional form of visual map that fully integrates multiple maps of an individual’s or group’s or company’s online presence to simultaneously include their Twitter, Facebook, LinkedIn¹, Instagram and other social networks. Maybe a platform like the Hyve-3D visualization system² could be used to enable a more broadly extensible and scalable 3D view. Perhaps this multi-dimensional virtual construct could produce entirely new planning and insights for optimizing one’s presence, marketing and influence in social media. If so, would new trends and influencers not previously seen then be identified? Could tools be developed in this system whereby users would test the strengths and weaknesses of certain cross-social media platforms links and relationships? Would certain industries such news networks³ be able to spot events and trends much sooner? Are there any potentially new opportunities here for entrepreneurs? A very instructive and illuminating example of the power of mapping a specialized Twitter network has just been posted by Ryan Whelan, a law and doctoral student at Northwestern University. It is composed of US law school professors who are now actively Tweeting away. He posted his methodology, an interactive graphic of this network, and one supporting graph plus four data tables on his blog in a February 3, 2015 post entitled The Law Prof Twitter Network 2.0. I highly recommend clicking through and reading this in its entirety. Try clicking on the graphic to activate a set of tools to explore and query this network map. As well, the tables illustrate the relative sensitivities of the data and their impact on the graphic when particular members of the network or the origins and groupings of the followers is examined. I think you find it inspiring in thinking about what situations such a network map might be helpful to you in work, school, special interest groups, and many other potential applications. Mr. Whelan presents plenty of information to get you started off in the right direction. I also found the look and feel of the network map to be very similar to the network mapping tool that was previously available on LinkedIn and discussed in the August 14, 2014 Subway Fold post entitled 2014 LinkedIn Usage Trends and Additional Data Questions. What effects, if any, is this network and its structure having upon improving the legal education system? That is, are these professors, by being active on Twitter in their own handle and as members of this network as followers of each other, benefiting the professor’s work and/or law students’ classroom and learning experiences? Are the characteristics of this network of legal academics any different from, let’s say, a Twitter network of medical school professors or high school teachers? Would more of a meta-study of networks within the legal profession produce results that would be helpful to lawyers and their clients? For example, what would Twitter maps of corporate lawyers, litigators and public interest attorneys show that might be helpful and to whom? 1. 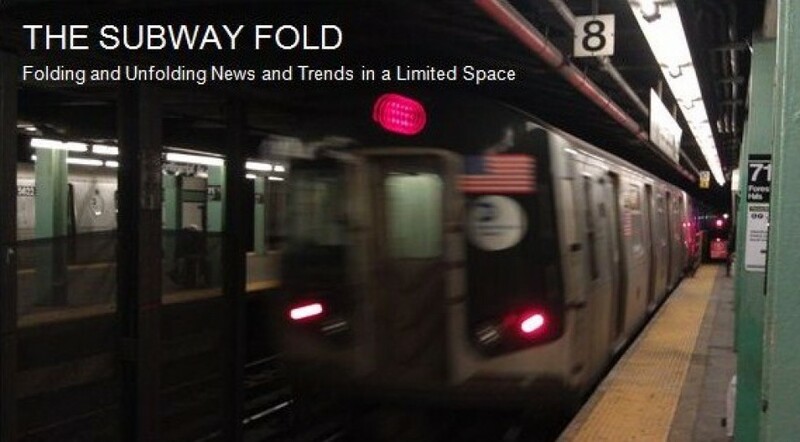 See the April 10, 2014 Subway Fold post entitled Visualization Tool for LinkedIn Personal Networks. 3. See also a most interesting article published in the September 23, 2014 edition of The New York Times entitled Tool Called Dataminr Hunts for News in the Din of Twitter by Leslie Kaufman about such a system that is scanning and interpolating possible news emerging from the Twitter-sphere.